We were only taking a casual walk around where Pantai Ceneng ends and a section of the road goes towards the Tengah beach. 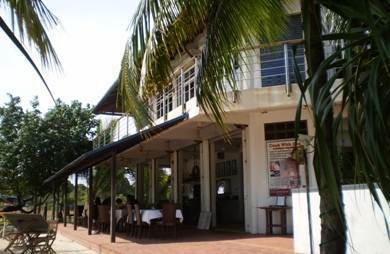 At the end of the road and right on Tengah beach where we found the Sugar Restaurant tucked in a corner. This was earlier the Lighthouse Restaurant & Bar. We kept looking at the surrounding and at the restaurant, and said to ourselves there couldn't be a better location that this. 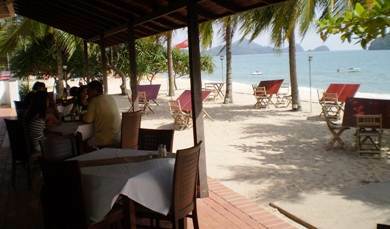 That's true, in the whole of Langkawi, we have found very few other places that can challenge Sugar when it comes to the beach-side location and a bistro type ambience. This is one of the best places to watch sunset with your feet right on the beach sand as you take a table outdoor. The seating extends into the beach. When the sun is not beating down, you can take a table right on the sand next to swaying palms & coconut trees, enjoy a beer or a cocktail and watch the spectacular sunset and small islands offshore. The view is undoubtedly marvelous. 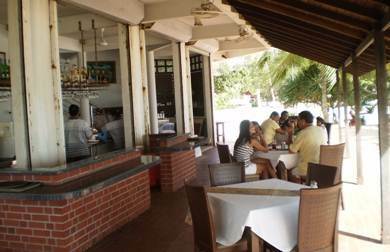 There is also a roof-covered verandah where you can sit too and watch the ocean and beautiful sunset. And this is probably the reason why the restaurant is a bit pricey compared to some of its peers. There used to be an old Lighthouse here and you can see that the old structure of the lighthouse is still retained. The two story building has alfresco dining and a bar at the ground floor, and another cocktail bar upstairs (the upstairs bar is however run by another establishment). They serve Malay and International cuisine. Well having dined almost in all places in Langkawi, I won't say that the food here is by any means the best when it comes to taste and presentation, but it is quite okay at the same time. What struck us was the price and that's probably the reason you should be able to walk in and find a table here although they insist on reservations. It is quite pricey. You can try out the prawn roll which is quite nice and accompany that with satay that comes with nice sauce. Another great dish here is the roasted lamb. You will also find Pizzas, salads (Caeser salad, calamari, mango/thai salad etc) in the menu. Three brothers run the Sugar restaurant, two of them are involved in the service. They are quite friendly and have chats with the guests. You can tell them if you want a dish to be prepared in a specific way and they try to accommodate. An attractive feature of Sugar is its long happy hours (4pm to 7pm) when cocktails and beers are available at low prices. You can get a table, have some beer (or try out the Lychee cocktail ... delicious) and watch the spectacular sunset and the lapping waves of the ocean. The Asian style tapas items are excellent too and are ideal to accompany with cocktails or beer. While in general the dishes are okay (although the portions may not be liked by big eaters), if you do a quick calculation, two persons having starters, A main course each, couple of beer and a dessert would easily require over RM120 to dine here. If you can take the brunt of the charges, then it's a great place to hang around in an evening, have some beer and enjoy the great views. Daily from 2pm to 10pm. They serve lunch and dinner. You can walk in. Reservation are preferred if you plan to dine here. (When you come to the end of Pantai Cenang and reach the road Jalan Pantai Tengah, turn right and go straight towards the beach. At the beach, The Sugar will be on your right).